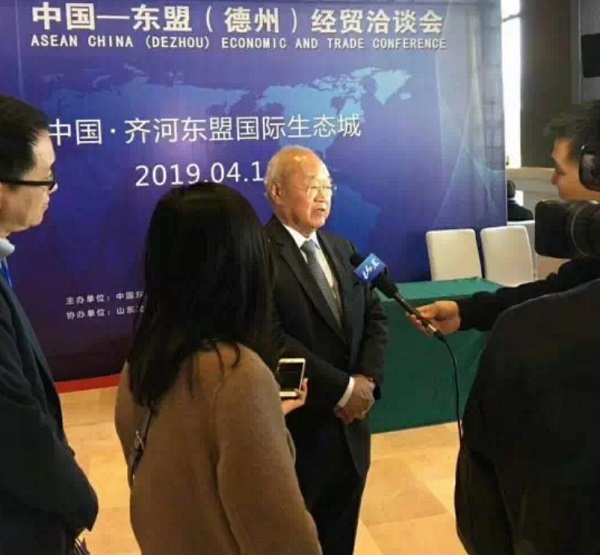 DEZHOU CITY, (Shandong, China) April 14 (Bernama) -- ASEAN businesses are urged to take the opportunity to expand their trade and investment activities in the northern region of China, namely Shandong, Tianjin and Hebei following rapid development taking place in the area. China-ASEAN Business Association (Caba) president Tan Sri Lim Gait Tong said it was timely to explore the region given that foreign trade volume recorded by ASEAN countries from the area was relatively low. “In 2018, the total foreign trade volume in the region totalled only 6.36 trillion yuan (close to US$1 trillion), but the ASEAN region only recorded about US$90 billion (US$1=RM4.11) last year,” he said in his opening speech at the ASEAN-China (Dezhou) Economic and Trade Conference. He said if businesses in ASEAN, including Malaysia, could further tap into China’s northern region, it would help increase the bilateral trade volume and even achieve the goal of China and ASEAN's US$1 trillion trade volume earlier than 2025. In 2018, China-ASEAN’s total bilateral trade volume grew 14.1 per cent to US$587.87 billion from 2017. “ASEAN's trade with China was mainly concentrated in China's coastal areas, such as Guangdong, Fujian, Guangxi, Shanghai, Jiangsu and other southern regions constituting 80 per cent. “The reason for this is that the southern region is mainly the hometown of Chinese diaspora from ASEAN countries,” Lim added. He also said that in making the 'One Belt, One Road' initiative a success and to achieve the goal of China-ASEAN bilateral trade volume, both parties should promote and strengthen human resources capability through training and the development of human capital. “On this matter, we want to promote the ASEAN International Eco-City project in Qihe County, Shandong Province, as a docking platform for ASEAN in the northern region, allowing more companies to have deeper exchanges with enterprises in northern China. “This will not only contribute to the development of bilateral friendship between China and ASEAN, but will also cooperate with the Belt and Road Initiative to contribute to the overall sharing of the regional economy,” said Lim. With the ongoing project, Lim who is also the chairman of Farlim Holding Sdn Bhd hopes to have better cooperation with Dezhou City and Qihe County authorities to jointly implement a “one platform, two-way development” so that Qihe's ASEAN International Eco-City, currently being developed by Farlim, will be oriented to the 10 ASEAN countries. “Besides that, we are also hoping to start negotiations with the Malaysian authorities and other ASEAN countries to have direct flights to Jinan, and create an international development route for Qihe County,” he added.